Set within 2.4 km of Pookode Lake and 5 km of Lakkidi Viewpoint in Vythiri, Girassol Serviced Villa provides accommodation with seating area and flat-screen TV. Free WiFi is offered. There is a fully equipped private bathroom with bath or shower and free toiletries. A continental or Asian breakfast can be enjoyed at the property. 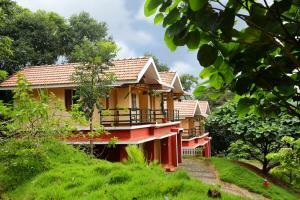 At the homestay you will find a restaurant serving Indian and Asian cuisine. Halal and vegetarian options can also be requested. Girassol Serviced Villa offers an outdoor pool. A children's playground is also available at the property, while guests can also relax in the garden. Chembra Peak is 25 km from the accommodation. Calicut International Airport is 75 km from the property. When would you like to stay at Girassol Serviced Villa ? Please inform Girassol Serviced Villa in advance of your expected arrival time. You can use the Special Requests box when booking, or contact the property directly with the contact details provided in your confirmation. Each day we'll check prices and send you an email for your selected dates at Girassol Serviced Villa. If you don't have specific dates but would like to check prices for say next weekend or say next month we can check the price too. Click to write a review and share your experience of Girassol Serviced Villa with other travellers.